Buffalo N.Y., 2017-Sep-03 — /Travel PR News/ — Delaware North Sportservice – a division of global hospitality and foodservice provider Delaware North – today announced it will open two year-round dining destinations as part of its operations at the innovative, new Little Caesars Arena: District Market, a 7,600-square-foot modern-day food hall and Kid Rock’s Made in Detroit, a contemporary food and music restaurant inspired by rock singer and Detroit native Kid Rock. Kid Rock’s Made in Detroit restaurant is a reflection of one of metro Detroit’s most loyal and successful native sons. Created in collaboration with Kid Rock, the 5,800-square-foot, 230-seat restaurant will offer a menu with a mix of classic Detroit and Southern-influenced dishes, along with traditional comfort foods and bar fare. The bar will feature local beers and craft cocktails that guests can enjoy before, during and after watching events at the arena. The restaurant is also designed to serve as an incubator of music talent, with a specific focus on local artists. Kid Rock memorabilia is part of the restaurant’s décor, as is a live-music stage that will showcase up-and-coming musicians. The District Market will house an array of distinctive food stations, offering everything from a light lunch, a hearty meal or an after-work cocktail. Guests can create their own salads or choose from handmade sandwiches, burgers, burritos, nachos, pastries and coffee from Zingerman’s of Ann Arbor. In addition to being a marketplace, The District Market will also be a community gathering place for residents, students and visitors of Detroit as well as sports and music fans attending events at the arena. Guests do not need to have an event ticket to enjoy these new dining experiences which will serve patrons on both event and non-event days and nights. Little Caesars Arena will be a focal point of The District Detroit, which is one of the largest sports and entertainment developments in the country, and will play host to a variety of concerts and special events, including serving as the home of the NHL’s Detroit Red Wings and NBA’s Detroit Pistons. Located in the heart of Detroit, this 50-block, mixed-use development unites eight world-class theaters, five neighborhoods and three professional sports venues in one vibrant, walkable destination for people who want to live, work and play in an exciting urban environment. 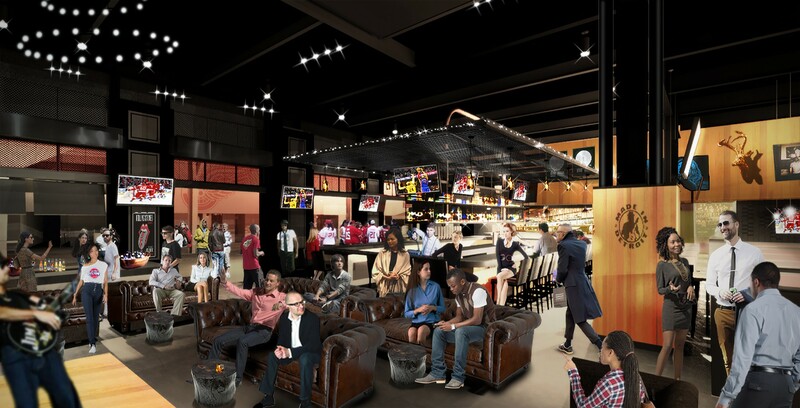 As the exclusive food, beverage and retail partner for Little Caesars Arena, Delaware North Sportservice will also be providing a full accompaniment of services inside of the 20,000-seat venue, including concessions, premium dining and a 9,500-square-foot retail store. This entry was posted in Adventure Travel, Attractions, Entertainment, Food & Drinks, Hospitality, Luxury, Society, Travel, Travel & Kids, Travel Services, Travel Tips & Info, Travelers, Trips and tagged Carlos Bernal, Delaware North, District Market, Kid Rock’s Made in Detroit, Little Caesars Arena, Sportservice, Zingerman’s of Ann Arbo. Bookmark the permalink.